The Parque Da Cidade is located in Porto and is the largest Urban Park in Portugal. It opened in 1993 and occupies 83 hectares and has about 10km of paths. The park is located by the sea and is perfectly framed within the city. The park is an ideal place to hold a festival. 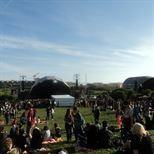 Please visit www.metrodoporto.pt for information. North: A28: head to Porto, take the exit toward "Matosinhos/Av. Republica", continue onto Av. Liberdade, at the roundabout take the third exit toward "Av. Dom Afonso Henriques", at the traffic lights take a right. A3: head to Porto, take the exit toward "A4", direction: Matosinhos, continue onto Av. Liberdade, at the roundabout take the third exit toward "Av. Dom Afonso Henriques", at the traffic lights take a right. South: A1: head to Porto, take the exit toward "Viana do Castelo/Matosinhos", at the AEP roundabout take the third exit toward "Estr. Circunvalacao/Matosinhos". The site is wheelchair accessible. Usually disabled platforms are erected for most events.